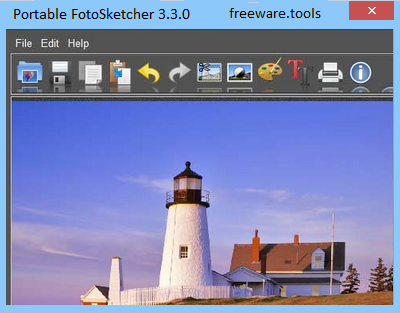 Portable FotoSketcher is a program which can help you convert your digital photos into art, automatically. You can create stunning images to make original gifts for your friends or relatives. Create birthday cards, season's greetings stationery, or simply print your work of art and hang it on the wall. Different styles are available: pencil sketch, pen and ink drawing, various painting renderings. You can also improve your original photo with simple tools. There are a variety of effects that can be applied to images, including pencil sketch, pen and ink, and painting, and each effect can be customized with settings for the size of the brushstrokes. Portable FotoSketcher is an image editing tool that you can use to transform your favorite photographs into artistic images. Since it is a portable product, the tool doesn't need to be installed. So, you can simply place it on a removable drive and run its executable file on any computer. More importantly, your Windows registry will not be changed in any way. The interface of the application has clean lines and is quite intuitive, so you should have a problem in getting around it. You can import images in the BMP, JPG, JPEG or PNG format by using either the file browser or "drag and drop" method. Batch processing is supported. There are several drawing styles that you can choose from and they include pencil sketches, pen and ink sketch effects, as well as stylized effects. Each style comes with its own configurable settings. For example, in case of pencil sketches you can adjust the edge threshold and intensity, color intensity, darken or lighten and level of contrast. But you can also soften edges, add a frame, select a texture and add text. Settings can be saved and restored to their default values. Furthermore, you can use the undo and redo functions, resize the source image, enable automatic contrast and sharpening, rotate or copy the picture, use the drawing as a source image, zoom in and out, and more. All in all, Portable FotoSketcher is an excellent tool for transforming your pictures into works of art and is strongly recommend it to all users.